Store Hours: Mon-Sat: 9 a.m to 5 p.m. & Sunday: 10 a.m. to 4 p.m. In art, experience and beauty often go hand-in-hand. Such is the case at Banana Patch Studio. 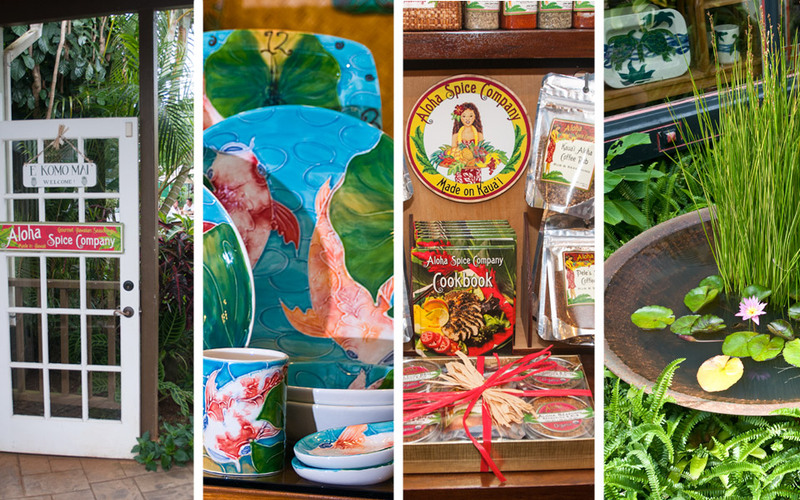 Kauai artist Joanna Carolan has created Hawaiian-themed, fine art, hand painted pottery, and ceramic tiles from her Kauai studio for almost 20 years. Her work, which is inspired by Hawaiian flora and fauna, has brought a bit of island style into thousands of homes, decorated one of Maui’s finest hotels, and been presented to the president of Tahiti. From individual pieces to commissioned works, Joanna’s ability to compose compelling images will bring a new life to your living space. Other unique items found at Banana Patch Studio include the series of award-winning children’s books illustrated by Joanna Carolan and written by her husband, Dr. Carolan, the Aloha Spice Company organic seasonings and rubs, hand carved fish hooks, Kauai-made jewelry, and other items Made on Kauai.